We have exciting news! We are looking for someone new to join the team at Made590 two days a week! Are you friendly, helpful and excited about Australian made fashion? Do you love quirky homewares and gifts? If this sounds like you or someone you know then pop us through an email to orders@made590.com.au, we would love to hear from you! We are looking for someone who will be an ‘all rounder’ in the store, with retail experience and computer knowledge a necessary part of the job. 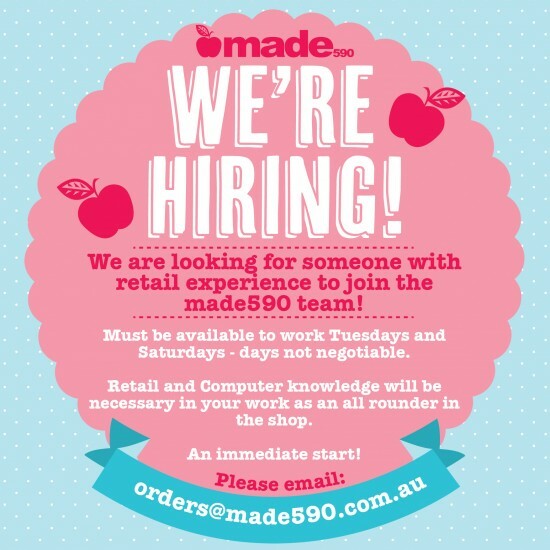 Jobs at Made590 don’t open up very often, so if you think you would be a fit with us please get in touch! You can either send us through an email or pop in and say hi instore! Previous Previous post: Summer Sale in Full Swing! Next Next post: We LOVE a Sale!